Manipulator for carbon and oxygen consumable lances - CEBA S.r.l. The manipulator allows the introduction of oxygen and carbon lances from the slag door of electric arc furnace for cleaning, decarburisation and foaming slag. 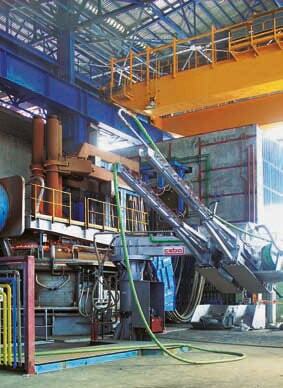 The manipulator consists of a vertical column with a rotating arm which holds the lances driving units. The frontal and lower parts of the driving unit are protected by a water cooled panel. The electrical and automation devices allow automatic and safety operation from remote control room; one local control box placed close to the machine is also foreseen for the local control of the manipulator. Several possible configurations starting from one single lance up to three lances (two oxygen and one carbon lances) are available. Each lance is provided with independent movement. The lances will be supplied with vertical movement to suit the optimum angle for oxygen and carbon blowing. Furthermore oxygen lance will be foreseen with horizontal movement in order to be driven into desired points for scrap cutting/cleaning, decarburizing, etc and to take the best advantage of the oxygen action during the melting phase. Quick joints are supplied for fast connection of the oxygen and carbon hoses to the lances. Regulation valve stand for oxygen is also offered with all the required controls and certificates and according to the main international standards.